The Honor 7X boasts the kind of impressive features normally found on phones twice the price. Enter our competition to win one for free! Looking for a feature-packed new phone that won't leave you out of pocket? The all-new Honor 7X fits the bill perfectly. The new 7X comes loaded up with features that you'd normally only find on far more expensive phones, but at an impressively affordable price - just £269.99 SIM-free. Why are we featuring a phone on DCW? Simple: Honor 7X's dual camera setup really is something to behold. The 16+2-megapixel sensor captures tons of detail - and with a second camera intelligently sensing the depth, it can deliver stunning portrait mode pictures. The Honor 7X also features a broad range of shooting modes, from Light Painting through to full manual, while the impressive 5.93 inch FullView 18:9 screen ensures your shots look great. As well as an amazing screen for your still images and videos, it's also the perfect aspect ratio for streaming TV, playing games and using creative apps. Win one of four Honor 7X's! What could be even more affordable than the already low price of the phone? A zero price tag. And that's exactly how much we're asking for the four Honor 7x's available in our fantastic competition. We're running exciting Instagram competitions to see your takes on the theme ‘Max Your City’, and it's super-easy to enter. Simply post your pictures on your own Instagram account, with the hashtags #MaxYourCity and #Honor7XTR. Our team of professional photographers will pick a new winner ever week, and we'll announce them online, so make you sure you follow our Instagram, Twitter and Facebook accounts to see if you're the lucky winner. The first phone can be won by the best image posted between Friday 8th December and 2pm (GMT) on Friday 15th December, as judged by our team. Also be sure to look out for the #Honor7X hashtag across Instagram and Twitter to stay on top of Honor 7X news. Check out the Honor website here. 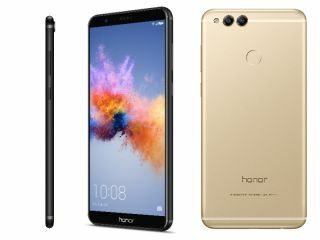 Although the Honor 7X boasts a huge screen, it remains a compact smartphone thanks to some seriously clever design. Rounded sides mean this immersive smartphone is both generously-sized yet simultaneously comfortable to hold, and minuscule bezels keep the 7X sleek all round. Colour options offer finishes that are classic yet eye-catching: from standard Black to a rich metallic Blue. ﻿By taking part in this competition you agree to be bound by these terms and conditions and the Competition Rules: www.futuretcs.com. Entries are submitted by posting a public picture on Instagram with the following two hashtags- #MaxYourCity and #Honor7XTR. Posts must be made live between 08/12/2017 and 2pm (GMT) on 15/12/2017. Open to persons aged 18 years or over. There will be one winner entitled to one Honor 7X handset, which shall be subject to the terms and conditions of Huawei Technologies Co., Ltd. The winner will be chosen by a professional photographer on the basis of the quality of the photo and the relevance to #MaxYourCity. The winner will be notified via direct message. The prize is non-transferable and non-refundable. There is no cash alternative.